FAR Circuits is now making available an assembled and tested board for the Bluetooth Digital Setting Circles project described here. The board includes a preprogrammed PIC16F628A chip as well as a fully-configured RN-42 Bluetooth module. 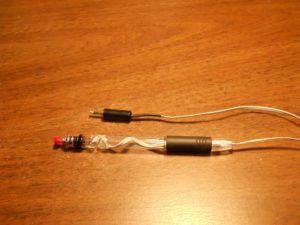 You’ll still need to solder a connector for your power source of choice, and you’ll need to obtain your own rotary encoders and connect them through the RJ-45 port included on the board. For ordering information, go here. This is a little tidbit I stumbled across while reading KE7X’s “The Elecraft KX3 – Portable” manual. I was interested in adding a PTT switch of some sort to go with the lightweight computer headset I intended to use for portable operation with my Elecraft KX3. It’s possible to use the XMIT button on the front panel for PTT, but I wanted something a little more convenient. Homebrew PTT switch for the KX3. Thanks to some help and testing from Pete Eschman, I’ve been able to restore support for Orion telescopes to my ASCOM Driver for Digital Setting Circles. Specifically, Orion Sky Wizard 2 and 3 and Orion Intelliscope platforms should now be working. Please let me know if you have problems using the driver with these platforms. Orion itself gets no credit for this–they repeatedly ignored my requests for technical support on this issue, despite the fact that the ASCOM driver they published was a slightly-modified version of one of my earlier drivers.